This historic square in the middle of Durban is the spot where the city originated as a tiny settlement of itinerant traders and hunters in the early 19th century. It is named for Henry Francis Flynn, one of the prominent inhabitants of the time. Around the square are some interesting sights, particularly the 1910 City Hall on the south side, which is an exact replica of the City Hall of Belfast, Ireland. On the first floor of the City Hall is the Natural Science Museum with an interesting insect section and an array of stuffed animals which delight children despite being somewhat old-fashioned. On the second floor is the renowned Durban Art Gallery. Parents may want to explore the art gallery as their kids enjoy the Natural History Museum. Various musical, song, and dance performances are held on the City Hall steps every Wednesday, at about 1pm. 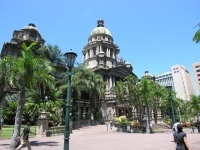 Alongside the City Hall is Durban's local history museum, housed in the Old Court House, which was the first public building ever erected in Durban, in 1866. The Square is easily accessible by bus or taxi, and is a great place to take photos, but be careful with expensive cameras and watch your belongings as the city centre is rife with pickpockets.